We live and prove our philosophy every day: We challenge our processes, our services and ourselves to ensure the best outcomes. We are accountable and transparent—and expect clients to be accountable, too. We are not afraid to push the boundaries—or to veer from the pack. We seek out the best investment products and strategies, apply rigorously defined practices, and constantly strive to make it all even better. We measure success in our client relationships through the C.A.R.E. model. This framework is essential to how we keep you informed, and provide the best strategies to deliver on your investment objectives. Our Philosophy begins with you, our client. The relationship you build with your advisor endures, which is why we begin with a foundation of mutual respect, trust and understanding. We are there for you each step of the way, providing the expertise, support and guidance necessary to make sure each of your life’s qualitative dreams may be achieved. We serve as the one-stop resource for our clients and the means to addressing their goals through comprehensive management techniques, cutting-edge ideas and individualized attention. We work to manage both sides of the balance sheet for individuals and their businesses. We know how hard you have worked for what you have, and we work just as diligently to preserve your wealth and grow new wealth for future generations. 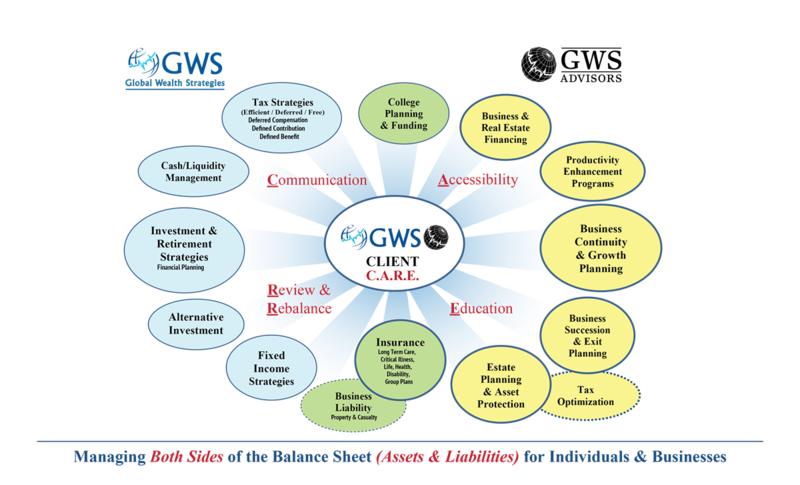 Our mission is to provide greater financial security and higher quality of life for everyone that meets with GWS. We consider your vision for your life, your financial commitments and how you view and experience risk. We advise you on a comprehensive, multi-dimensional strategy and work diligently on a plan to optimize it. We continuously reassess to ensure your goals and strategy are aligned. We encourage ongoing conversation. We measure our success through our Client C.A.R.E. model. Consistent Communication drives the relationship between you and our team of advisors. We pride ourselves in our ability to remain Accessible for all our client’s needs. We Review and Rebalance your strategy as your needs and goals change throughout your life. We strive to empower and Educate as we work together to fulfill your unique vision.